Two Bears Farm and the Three Cubs: 500 Followers Holiday GIVEAWAY! 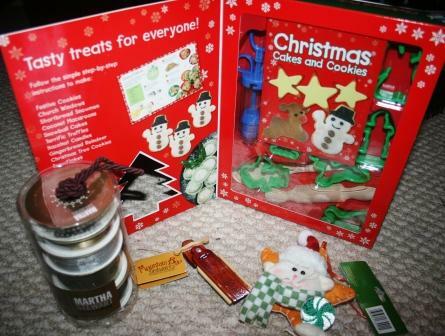 A Barnes and Noble cookie making set, that includes cutters, recipes, and more, a Martha Stewart tower of gift wrapping ribbon, a cute wooden country sled ornament, and a plush cat ornament. I tried to get a picture of the ribbons, so you can see the colors better, but it was tricky since it's under that reflective plastic. Even without a flash! Anyhow, the colors are golds, silvers and black, very pretty. To enter, you must be a follower (you can become one and enter, if you're not one already!) and you must leave a comment telling me one item that is on your holiday wish list this year, and be sure to leave a way to contact you (email address) if it is not already attached to your email. Winner to be chosen by Random.org and must respond within 48 hours, or a new winner will be chosen. In the spirit of the holidays, I'm willing to ship anywhere. Giveaway to end on 12/12/11 at noon. Thanks for entering, and for following my blog! And now to announce the winner of the Eco Natural Soaps giveaway - Random.org picked #23 - J.P. from Home in the Hollow! Congratulations J.P!! And thanks so much to all those who entered! My wish already came true - my boy is home for two weeks! WooHoo! Congratulations on over 500 followers, Lisa. Well deserved. Congrats to JP. She's a lucky girl. And yes, please enter me in your drawing. You picked out some really nice treasures. I am so excited for you! You have worked hard and I am so glad so many realize this is the place to start the day. Well-deserved congratulations on 500 followers, my friend! Pick me,pick me! I like that ribbon! What a cute, timely giveaway. The cookie cutter set is so adoreable!! What a great giveaway! Congrats on 500 followers. Congrats on the 500--that is a great achievement. Congrats on OVER 500 followers!! My wishlist has one item and that is a new lens for my camera. 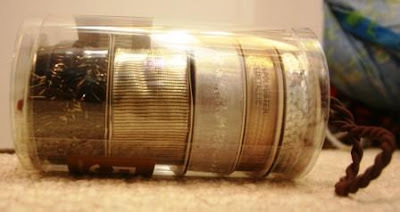 If I get any money for gifts this year (gramma and my husbands family usually give $$) I hope to purchase that lens. love the color of those ribbons!! Congrats on 500 Followers! That is awesome! I'm a follower and I'd love some new boots. Yay for 500 followers! My wish list is a Hummingbird music box similar to one that was my grandma's. But the cookie cutters might be better for the kids! Congratulations on reaching 500 followers!!! Yeah!! Love that cookie cutter set!! Very cute!! I have lots of things on my holiday wish list this year but I have a feeling I won't be getting #6, which is peace and quiet wrapped up in a box. So I'll just be happy if I get a new food processor since the one I've had for 10 years just broke. Congratulations on 500! I've loved reading your blog! And very fun gift pack! I never met a ribbon I didn't like. Loved your Muffin Tin post yesterday. Oh, what fun! A Christmas gift for one of us! I love giveaways, and they are even better at Christmas! I will go one better and tell you TWO things that are on my Christmas wish list! The video "Life In A Day", and the magnet game "Jishaku". Congrats on 500!! :-) Looks like you're up to 516 or so now!! One item on my holiday wish list is having a wonderful time with our neice and nephew (the runners) who will be here with us!!! We are so excited! I just want them to have the best time! If I win please send to Melodie at Laughing Duck Farm. I have so much ribbon and Christmas stuff :O). These are great give a ways for someone to win and use! Congrats on 500 followers!! I would love a new iPhone for Christmas. My 3GS is almost out of commission! Lol. I have a couple books and a new pair of running shoes on my Christmas list. This year I want a lightscoop for my camera. I heard it works great! I am a follower in GFC. I want a cruiser bicycle.